I think society should be based on a genuine application of the Golden Rule principle. Do you disagree with that? This means shaping society on the basis of equality and mutual aid and democracy. If you disagree with this, then be my guest and reveal to the world that you are an anti-social nut. I think the economy should be a "sharing economy" based on the following principles: 1) People, up until some reasonable age of retirement, ought to contribute to the economy a reasonable amount, given their ability. 2) Among these people economic products and services should be freely shared (not bought and sold) according to need when sufficiently plentiful, and otherwise rationed in an equitable manner taking into account need. 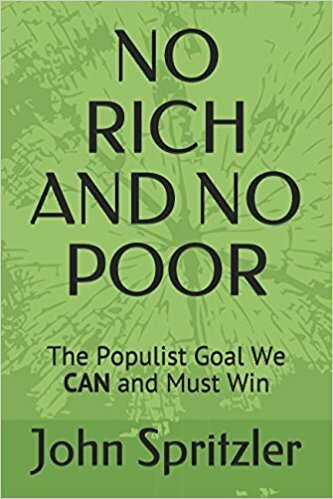 Everybody should have the same status economically: nobody is rich and nobody is poor. The decisions required to do this (i.e., deciding what is a reasonable contribution to the economy, a reasonable retirement age, etc.) should be made democratically, as discussed below. Your arguments always assume--without ever allowing this assumption, itself, to be questioned--that the only way people can be economically efficiently productive is if they work in a capitalist society, based on greed instead of mutual aid, based on buying and selling instead of sharing, based on inequality with some people rich and others poor instead of based on equality. Your whole right wing shtick is simply to argue that if our society is going to be a capitalist one, then the conservative way to do it is better than the liberal way. But who cares? The problem with our world today is capitalism. In order to maintain the inequality it is based on, the rulers of a capitalist society have to do terrible things to make people controllable, because most people want a more equal and democratic world.